Their breakthrough 2012 album, Light Up Gold, received high praise from fans and critics alike, labeling it an instant indie classic. So, what better way to eschew the lofty expectations and likelihood of a “sophomore slump” than by quickly throwing out more great music? Well, that is exactly what the Texas-by-way-of New York post-punk practitioners Parquet Courts have done with the release of their new EP, Tally All The Things That You Broke, out now via What’s Your Rupture Records. The bouncy, ramshackle rock of the opening single, “You’ve Got Me Wonderin’ Now” comes complete with a flimsy yet fun Flutophone (remember those from your fourth grade music class?) melody and some other noisy outbursts for a standout moment. Next, the energetic “Descend” ascends with jangly guitars and a snarling, shouty post-punk vocal and then falls apart at the bridge before launching back into the forceful opening guitar riff to end the song on a high note. A fuzzed-out bass line and a stuttering drum beat opens “The More It Works” as a twitchy guitar melody elbows its way in, ushering in an off-kilter and dissonant guitar solo along with some propulsive vocal patterns. This leads into the much too short, “Fall On Yr Face” which is built on a wobbly guitar line and a rapid-fire vocal that fractures and splinters into caterwauling chaos for another standout moment. The five-song EP closes out with the strange, hip-hop inspired “He’s Seeing Paths”, with elastic guitars, doorbell and cowbell samples and clever, rapped lyrics about a bike-messenger marijuana delivery service that most closely resembles the Beck-like mish-mash weirdness of parent band, Fergus And Geronimo. Like most bands do with between-album EP’s, Parquet Courts chose to deviate from their original sound slightly with experimental embellishments. 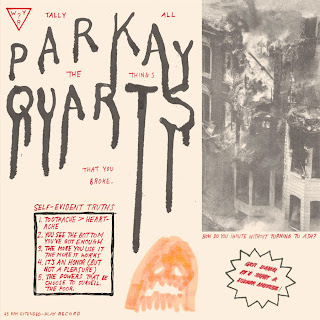 Sometimes these EP-sized experiments fail but like the Tally All The Things That You Broke EP proves, Parquet Courts are still having fun and not letting the pressure get to the their heads, and it only heightens the anticipation for what they might do next.